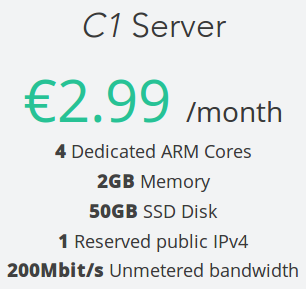 Yes, that’s right… Due to me not being able to afford the excellent dedicated server that XMPP.is ran off of in the past I’ve had to make the switch to a cheaper and much more efficient scaleway.com ARM server. Since I did not utilize most the dedicated server’s resources I believe Prosody will run just fine on it. For the price this thing is well worth it. Can we call XMPP.is “green” since we use an efficient ARM server 😀 ? I know there might be some concerns about privacy in France especially about all the controversy with anti-privacy laws being proposed/passed. I don’t think there is much of a risk, since no logs are being stored and the passwords are hashed. The most someone could get out of the server is who your buddies are. If you connect with Tor it makes it all-the-more confusing for people who wish to find your location. If something more serious like the server being setup as a honeypot I’m pretty sure I’d know about it. I am confident in my security practice. Besides that, everything has been completely migrated to the new server and it should be functioning as it always has. If you have any questions or problems you can always contact me.